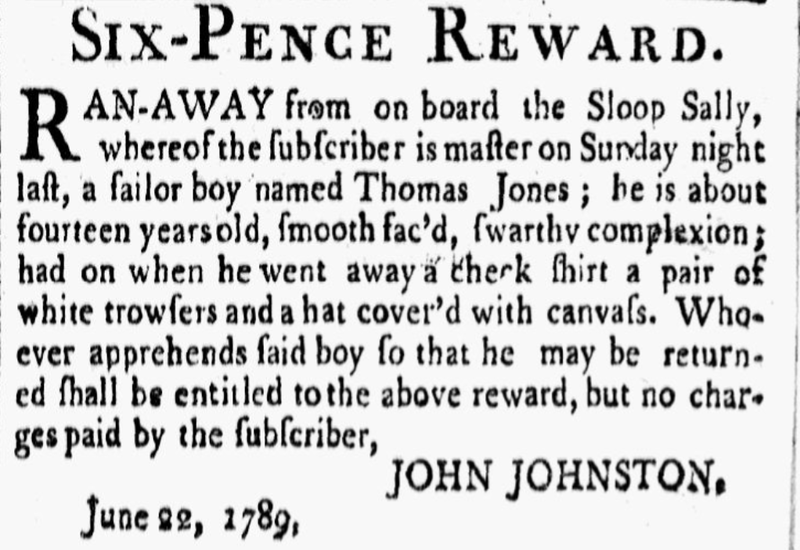 Authors and historians have long assumed that eighteenth century sailors wore tarpaulin hats to protect themselves from inclement weather at sea. It has become a trope repeated in academic works and popular culture alike, but one little explored. The tarpaulin hats we tend to think of are made of straw and coated in a weather proof seal of black tar, pitch, or paint. Certainly these hats existed in the nineteenth century. I was lucky enough to hold Richard Henry Dana's straw tarpaulin hat that he wore during the events related in the 1830's memoir Two Years Before the Mast, now in the collection of Mystic Seaport. Straw hats like Dana's are uncommon in eighteenth century artistic depictions and not often mentioned in period sources. I only know of one visual representation, and that at the very tail end of my era of interest. 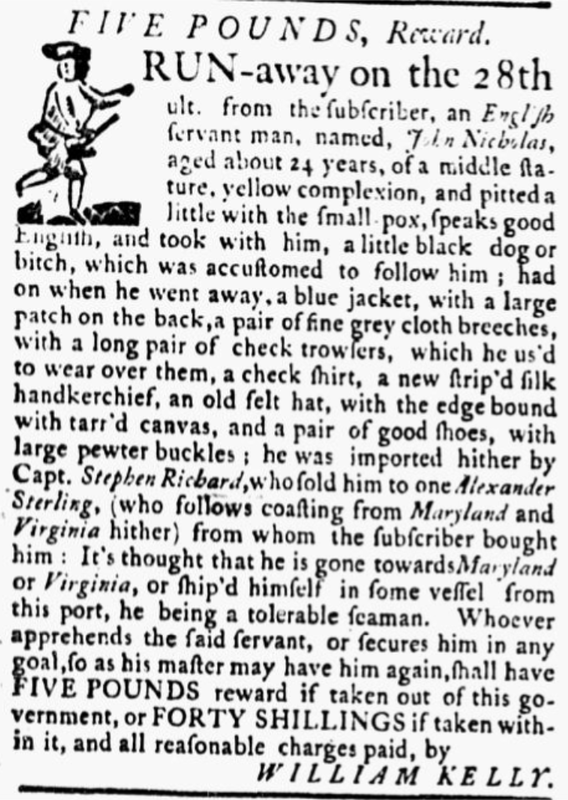 Hats made entirely out of canvas, in both the eighteenth and nineteenth century, are unheard of. 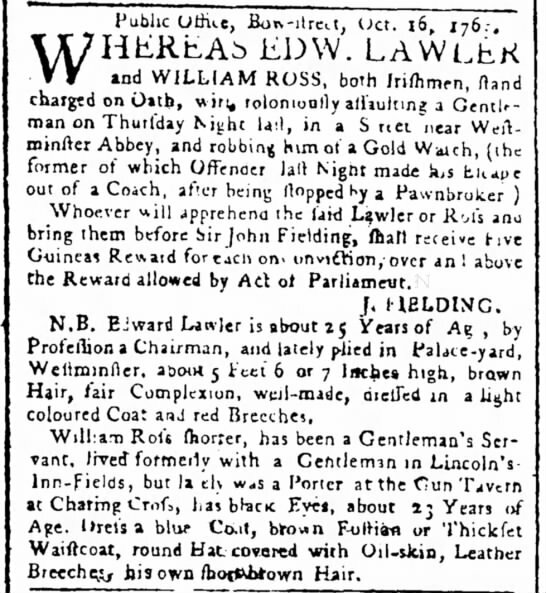 The Public Advertiser, October 18, 1765, page 3. The one surviving example of a canvas covered felt hat was recovered from the General Carleton shipwreck that went down in 1785. Notably, the hat is coated in tar. 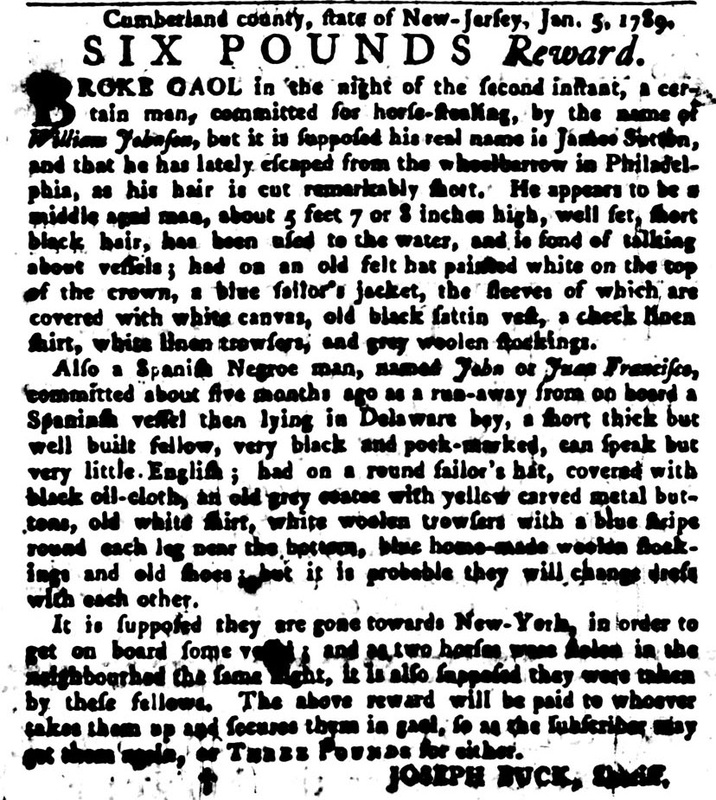 Earlier that same year, an advertisement was placed in the Pennsylvania Gazette for a Spanish sailor who had escaped jail, and was said to be wearing 'a round sailor's hat, covered with black oil cloth.' 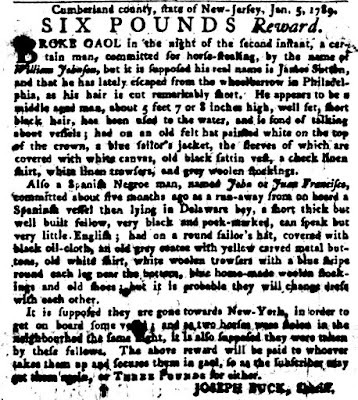 The rest of his clothing is highly unusual, and so it may well be that this hat is because of his Spanish maritime tradition, not British. What was the purpose of the canvas hat? The obvious assumption is for weatherproofing. Canvas sewn onto felt could prevent the felt from absorbing moisture. This would be doubly true of a hat covered with oil cloth. It is often asserted that this is where the name Jack Tar springs from. Tar is ubiquitous on sailing ships and undeniably sailors were referred to as tars. It even forms the name of this blog. But tar need not come from hats alone. 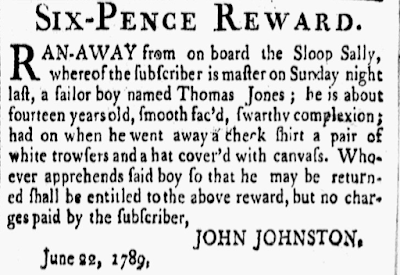 There are numerous runaway advertisements that refer to sailors with clothing covered in tar. Was this intentionally applied for waterproofing, or was it just the result of working on a ship? 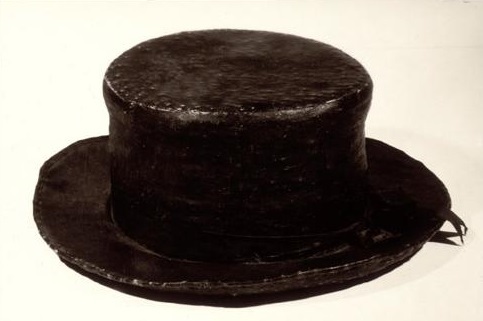 Visual representations of sailor clothing (the focus of this blog) are too vague and indeterminate to draw any conclusions on the material of hats, but the documentary record for canvas hats is sparse, and silent on intentionally tarring hats. 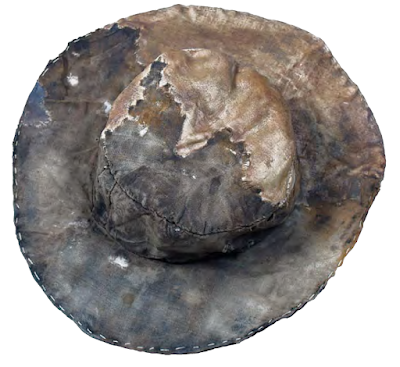 In reviewing my notes and looking at the photos I took in Poland, it is clear that the canvas was applied to the hat in an attempt to prolong the life of what was a really beat up piece of clothing. The brim and crown had significant sections missing- the period repairs or attempts to stabilize it are clearly visible on the underside of the brim. In short, tarpaulin hats, as such, have virtually no documentary evidence. Hats covered in canvas, likely to prolong the life of those hats, have some support, but are still rather rare. Felt hats and various kinds of caps are overwhelming supported by documentary evidence, and clearly formed the vast majority of sailors' head wear. The 1911 transcription of The Logs of the Serapis - Alliance - Ariel Under the Command of John Paul Jones, 1779-1780 states that John Atwood joined the crew of the Bon Homme Richard on April 6, 1779 at Paimbœuf in western France, and deserted on July 6 in L'Orient. His freedom wasn't long lived. A calendar of John Paul Jones manuscripts in the Library of Congress, published in 1903, states that he was court-martialed on July 29, 1779 and found guilty of desertion. Excellent article as always! Thanks for posting.